The history of trains in the Cuyahoga Valley stretches back more than 100 years. In 1880, the Valley Railway began operations, transporting coal to Cleveland, Akron, and Canton from the Tuscarawas River Valley and providing passenger service along the way. After a decade of operation, the Valley Railway became part of the Baltimore & Ohio Railroad. In the 20th century, competition from automobiles, trucks, and buses caused the decline of both freight and passenger service. Interest in the line was renewed in 1972 as a scenic excursion route and the Cuyahoga Valley Preservation and Scenic Railway Association was born. Originally known as the Cuyahoga Valley Line, the scenic railroad now operates as Cuyahoga Valley Scenic Railroad (CVSR). 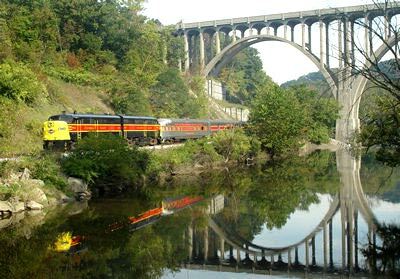 The CVSR runs through Ohio's only National Park, the Cuyahoga Valley National Park, from Cleveland to Akron and Canton. A variety of excursions are offered year-round and each trip is a different adventure filled with fun, history and beautiful scenery. The Cuyahoga Valley has four depots. In Cleveland, the train departs from Rockside Station near Thornburg Station Shopping and Lockkeeper's Restaurant. There are also depots in Peninsula, Akron (on Ridge St.) and in Canton.